Against the Current: Hero and villain are pitted against each other in a heart pounding rescue mission gone wrong. Grant Cooper, head pilot of an H-65 helicopter out of Coast Guard Air Station San Francisco, is the man in control of his life. Or so he thinks until an emergency endangers his ex-lover’s life. Julie MacKinnon couldn’t suffer Grant’s command. One sinking vessel, four surly smugglers and a breech in regulations shake them to the core. Can he save her and his crew in time without sacrificing himself? Mini-synopsis: Grant Cooper is England’s finest. He’s on a four-year tour of duty as an exchange flight officer to the United States Coast Guard. Always the man in control, he’s the model of the perfect Search And Rescue pilot.It’s not command that Julie MacKinnon fancies. She dumped him once in protest. 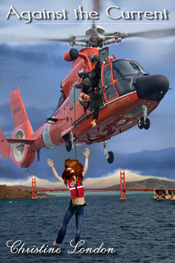 After all, there are enough constraints in her life as an Emergency room nurse and volunteer Coast and volunteer Coast Guard Auxiliary crewwoman.When fate throws the two back together in the middle of a heart pounding emergency, will Grant be able to put the requirements of his position aside long enough to save his crew and their love?